It was a beautiful day – though the weather forecast for the rest of the country is snow – so we drove to the far North. 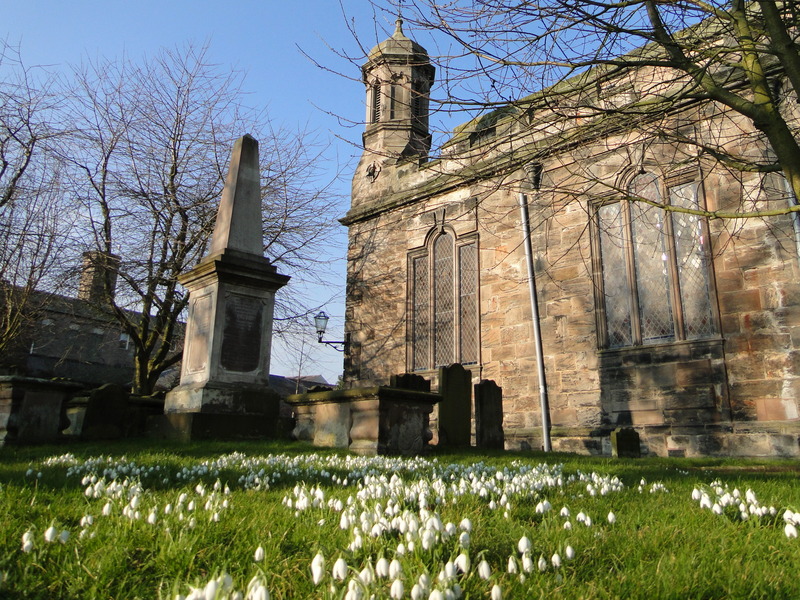 We have never had a proper look round Berwick – and it is a lovely town. 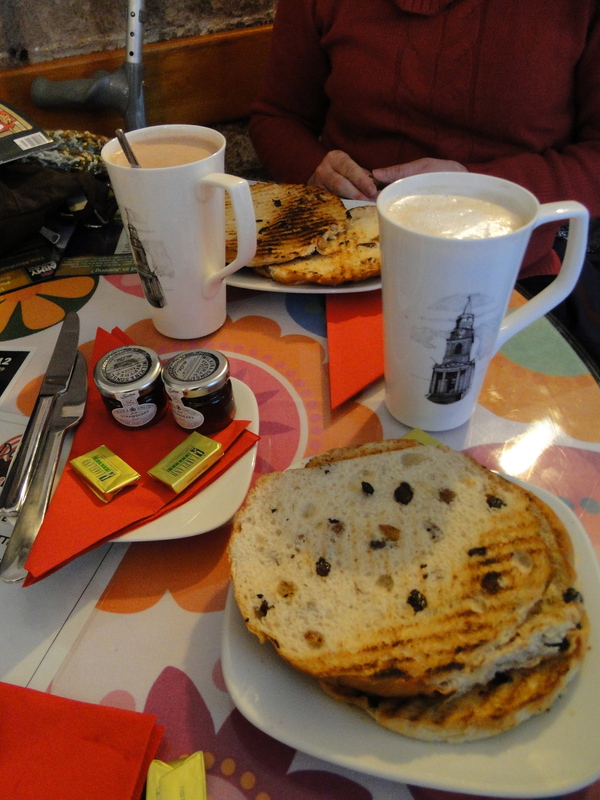 We started in Doolally (under the Town Hall) – look at the size of those tea cakes. They also do Haggis Toasted Sandwiches – you can tell we’re near the border. Then I left Julie and went for a wander down to the river, Pevsner in hand. Royal Border Bridge by Robert Stephenson, 1847-50. Another latte later we drove up to Holy Trinity and St Mary – NU000532 – “a building of quite exceptional architectural interest” (Pevsner). 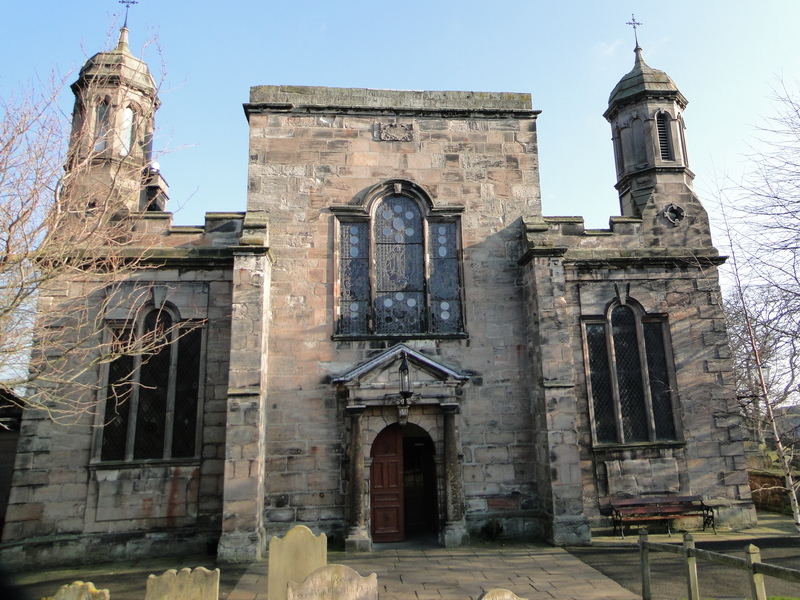 It was built 1650-2 on the initiative of Colonel George Fenwicke, Governor of Berwick. It was built by John Young of Blackfriars to his “own Moddell and Draught” – I wonder how/why he was dragged from London north. No tower – apparently Cromwell didn’t want one. 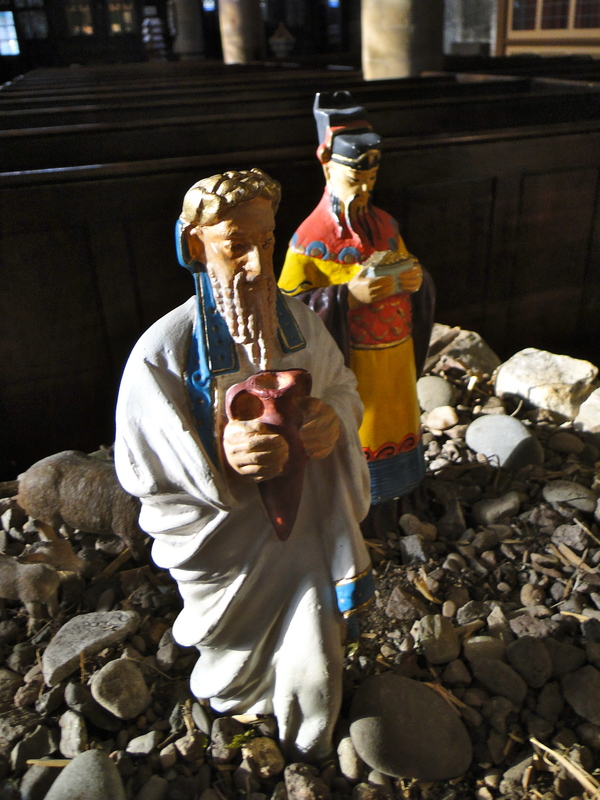 There were some changes in 1855, but it feels a very classical church – and I loved it. I also like the open door … they say they’ve got CCTV – I should have given it a wave. 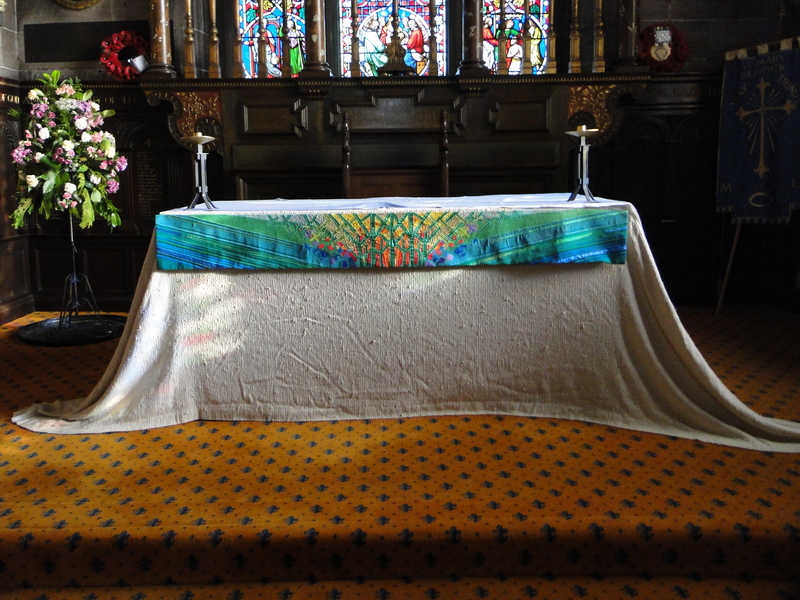 Looking east is special, and I love the altar frontal. 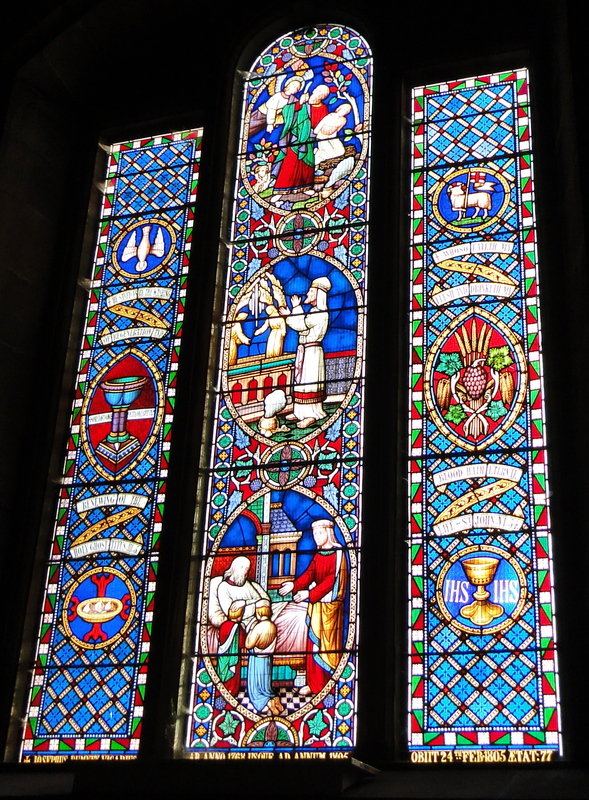 Pevsner doesn’t tell me who the east window is by – and there wasn’t a guidebook on sale – the reredos is early Lutyens (1893), but difficult to photograph. 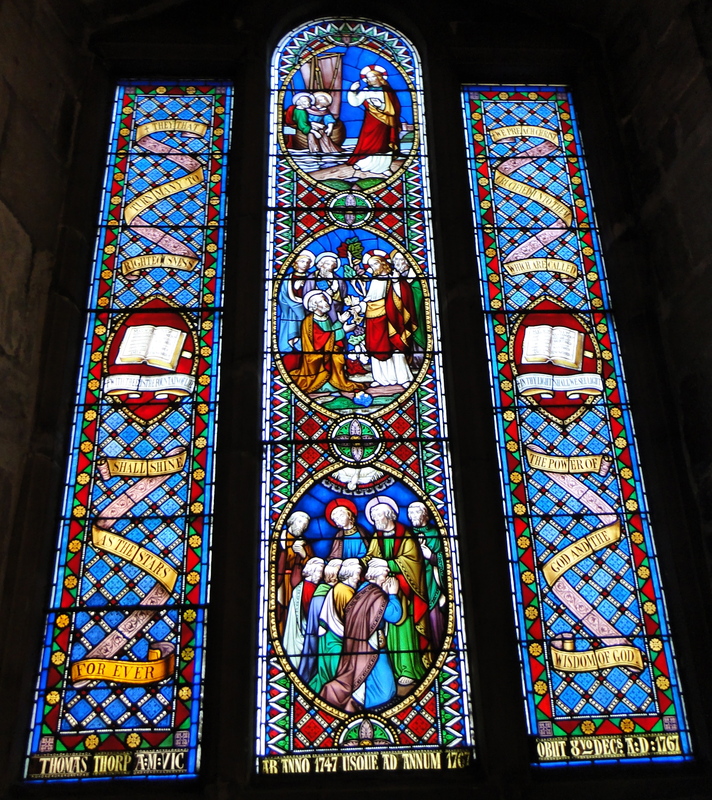 The Millennium Window is by Ann Sotheran. 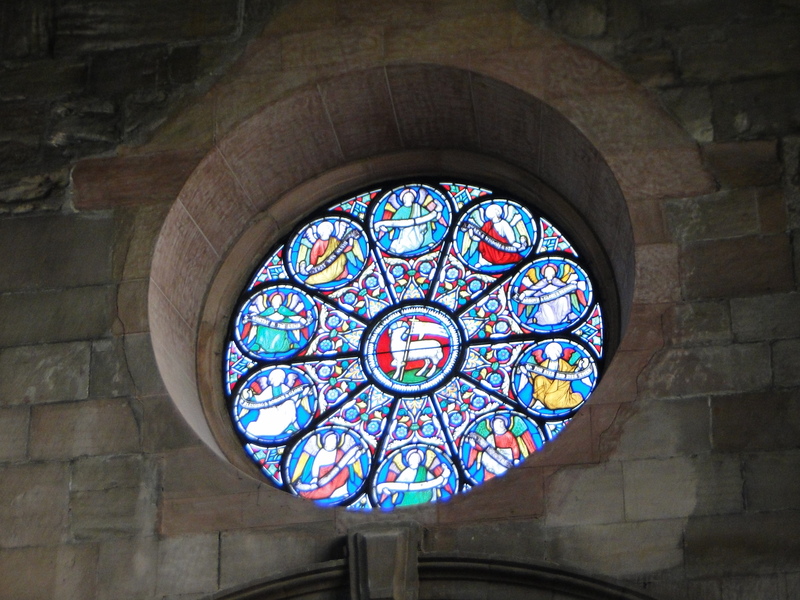 At the top of the centre bay the window holds the symbol of the Trinity, drawn as a Celtic knot, endlessly intertwining. Beneath is the Tree of Life also a Celtic veneration of growing things – God in Creation. 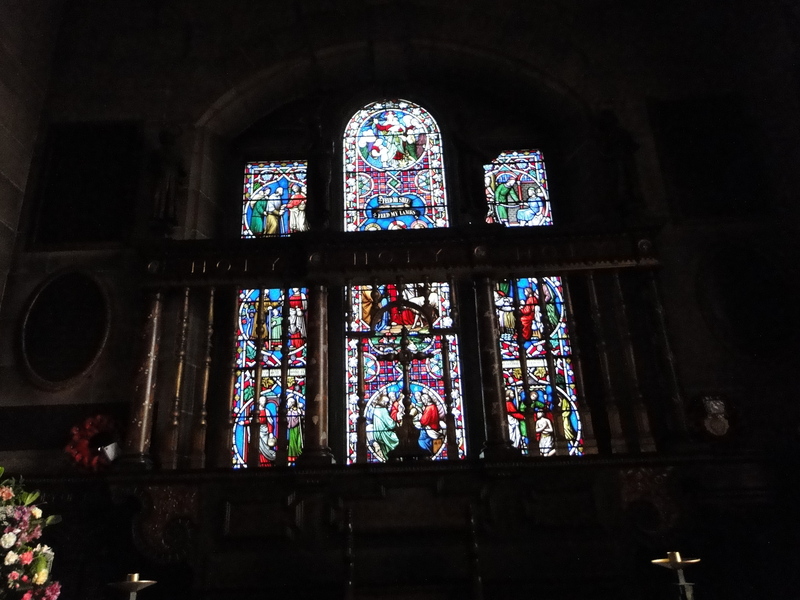 The Tree is nourished by the water of life, also the symbol of Baptism for the window which is directly above the fonbt. The image of the church is from a sketch by Susan E. Hughes. The water becomes the River Tweed, Tweed Dock and the coastline. 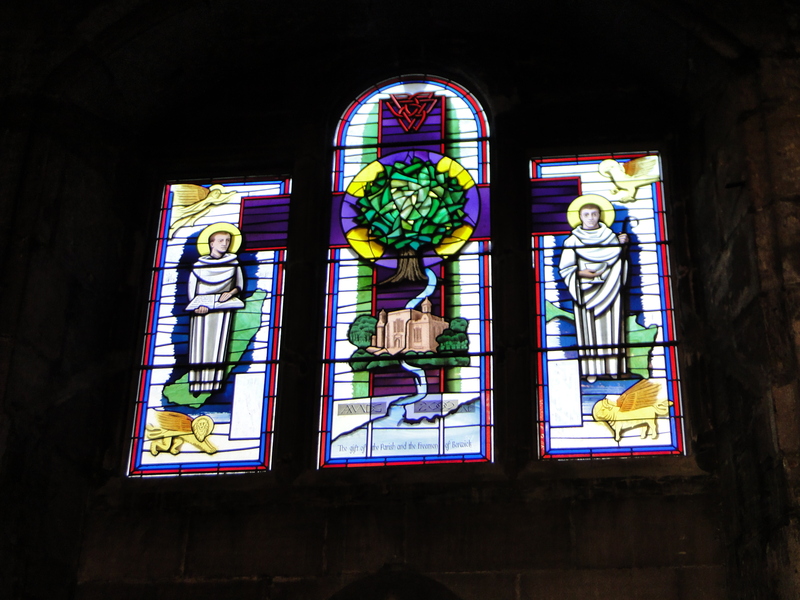 The main cross is Celtic, with a circle representing encirclement, protection and eternity – it stretches across all three lights of the window. In each of the four corners are the four Evangelists. In the left is St Columba with the Scriptures overlaying Iona; the right hand is St Aidan overlaying Holy Island. Wonderful. 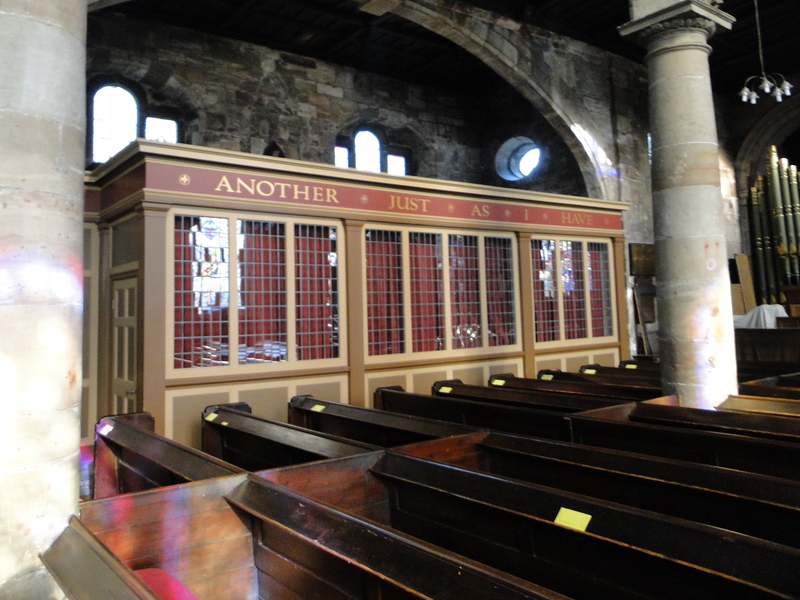 Interesting Vestry in the north aisle (modelled on a North Eastern Railway carriage? 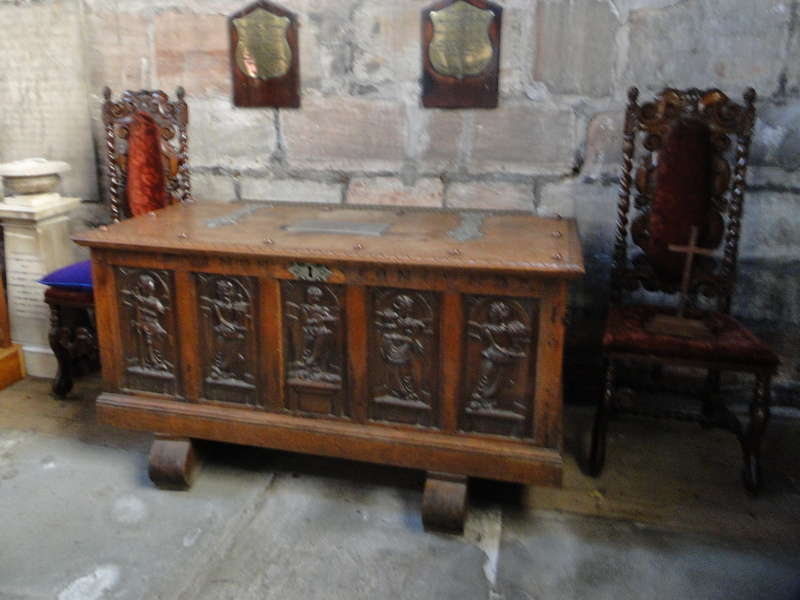 ), and furniture in the south (the latter made of panels from Berwick Castle, which stood on the site of the railway station – or should it be that the station stands on the site of the castle? You know what I mean). 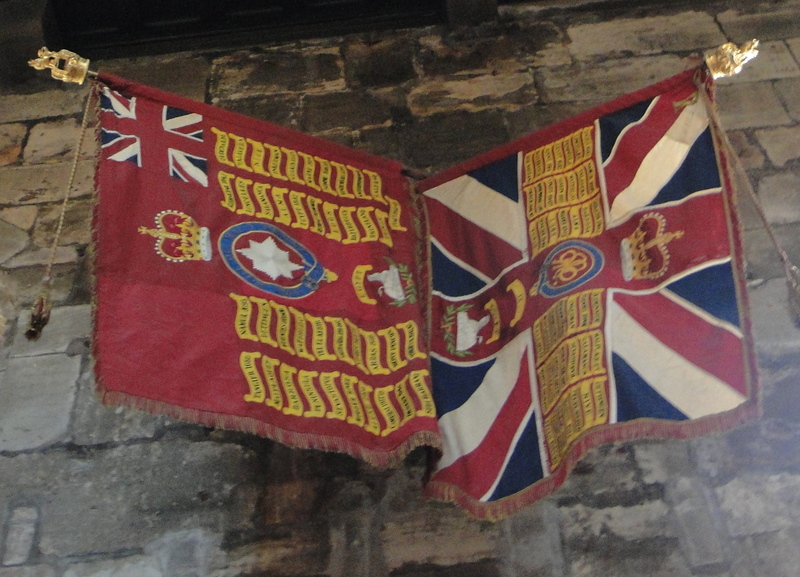 The standards are the Coldstream Guards. 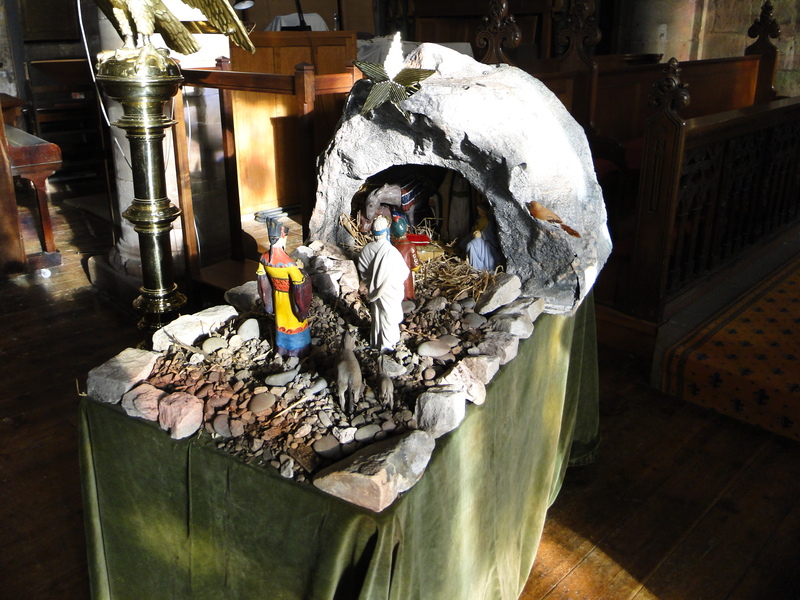 Candlemas was yesterday, but the Crib is still in place. I’m glad it was. I have never seen such an Oriental king. I had really enjoyed this church and, as I left the church, I looked up at this lovely carving – it holds the light over the door. 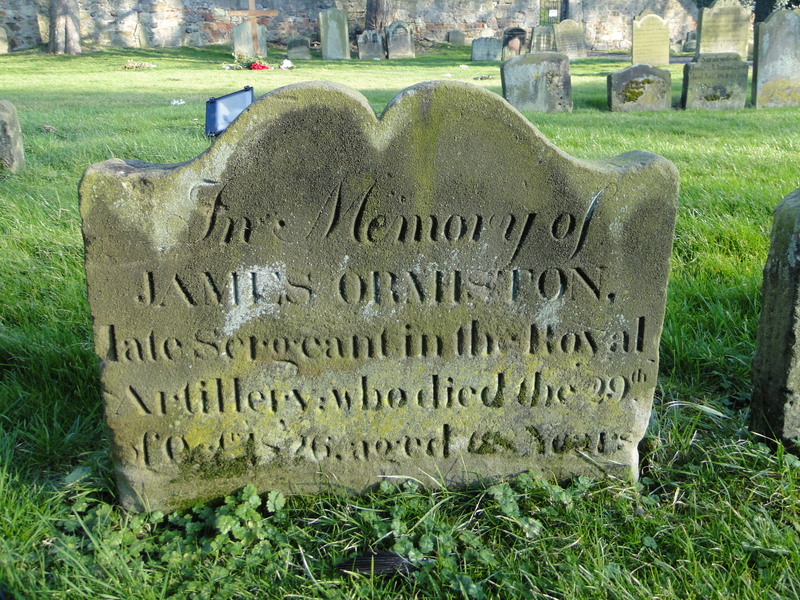 The churchyard has lovely stones and snowdrops, and is bordered by the ramparts, with the barracks on the south. 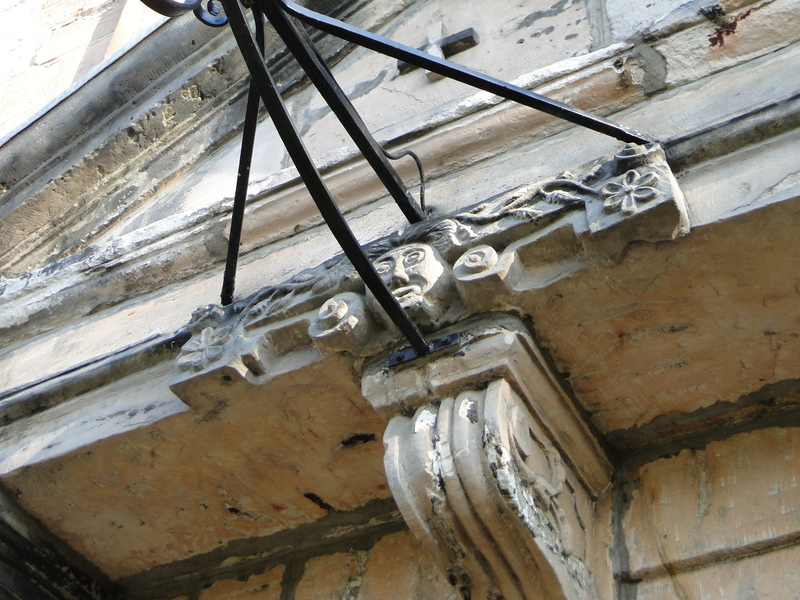 English Heritage close for the winter (the Church of England doesn’t) – so we’ll have to come back. Thankyou for your interesting blog. 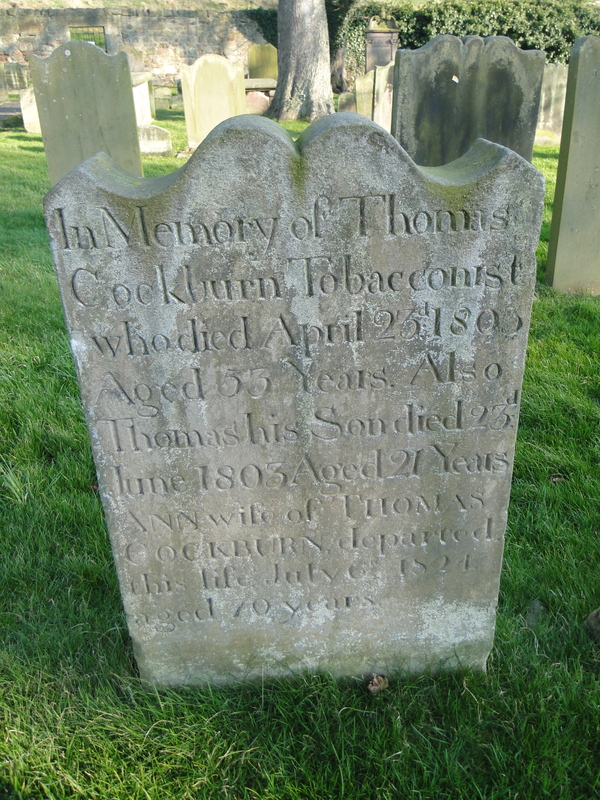 I know both Holy Trinity and St Mary, B-o-T and St Bartholomew’s and St Boisil’s at Tweedmouth. 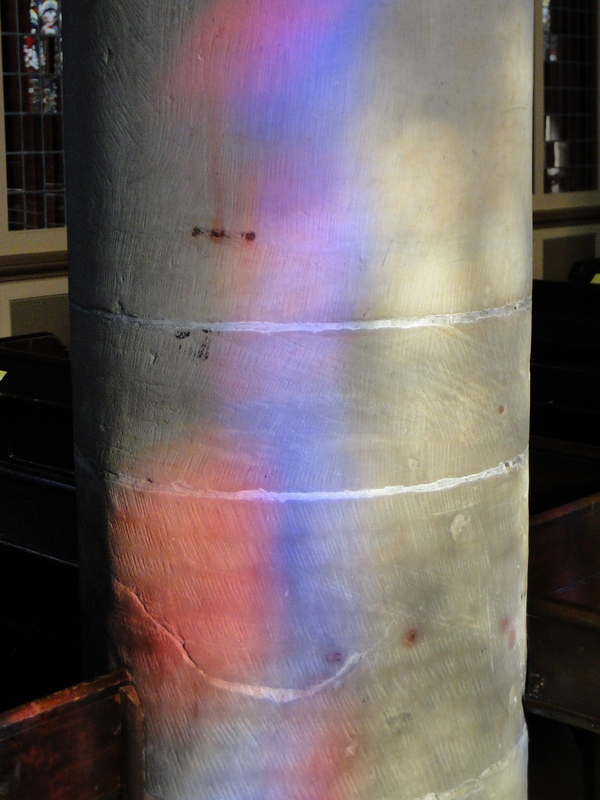 You visited in 2012 – come back there is lots happening at both churches. 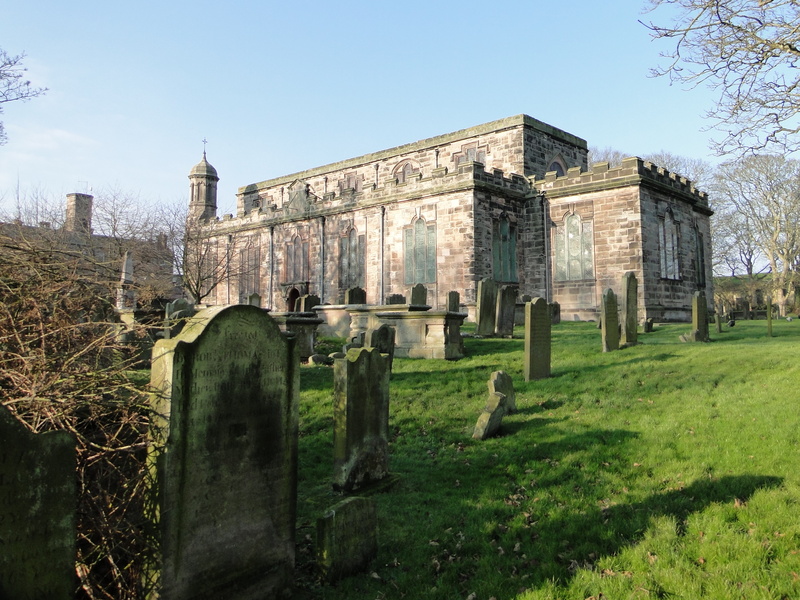 You would also probably find St John the Evangelist at Spittal interesting. 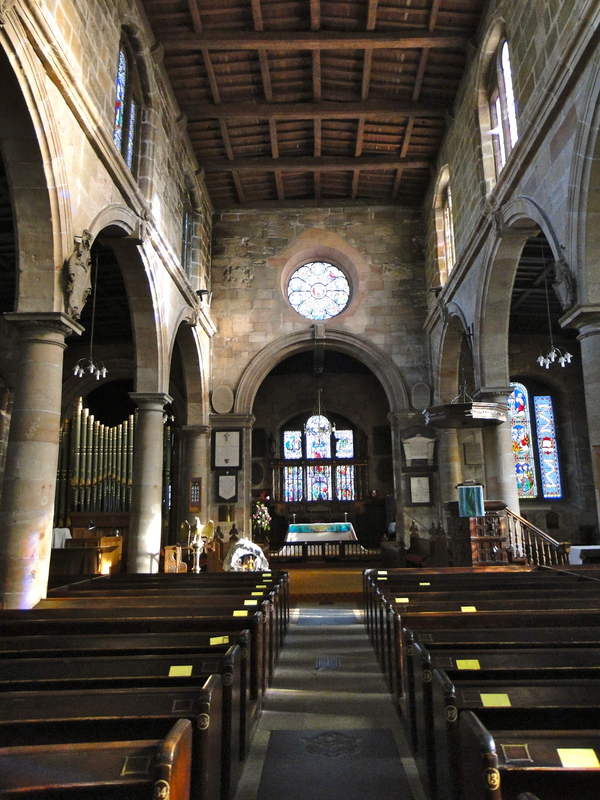 St Bartholomew’s has a 10.ooam Holy Communion every Wednesday in addition to Sunday Services. Refurbishment is currently in process there. 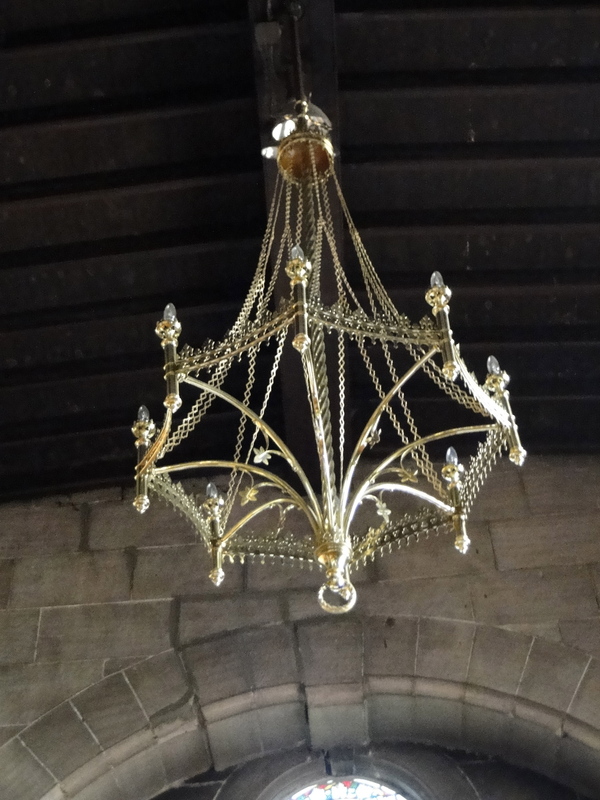 Please look on the relevant website for the times when you can visit St John’s, Spittal.